This is a favorite. 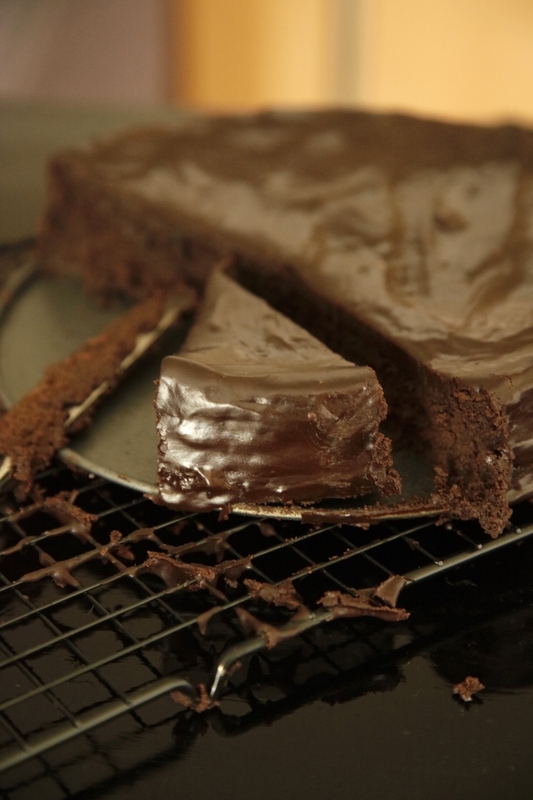 It produces a dark mousse like cake that is rich and decadent. • Preheat oven to 325 F. Line a 9 inch cake tin with parchment. • Melt the chocolate over a medium flame in a double boiler and let cool 15 minutes. •Whisk the brown sugar and butter in a stand mixer until fluffy and well incorporated. • Add the coffee and rum and whisk again. Gradually add the melted and cooled chocolate and beat until well mixed. Add the eggs one by one and beat again until incorporated. The mixture will be thick and gooey. • Pour into cake pan. Bake 60-70 minutes until a toothpick inserted in the middle comes out with some crumbs attached to it. Cover pan with foil and refrigerate 2-3 hours or overnight. Remove and unwrap and unmold. For the ganache melt the chocolate and cream to a smooth consistency in a double boiler or in a bowl over a water bath. Cool 5 minutes and then slowly pour over the cooled cake. Smoothen with a spatula until all sides are covered and let sit until chocolate stops dripping. Cover the cake with a loose lid that won't damage the ganache. Chill again until the ganache has set. To serve remove and unwrap and unmold. Let cake sit, covered about 20 minutes. 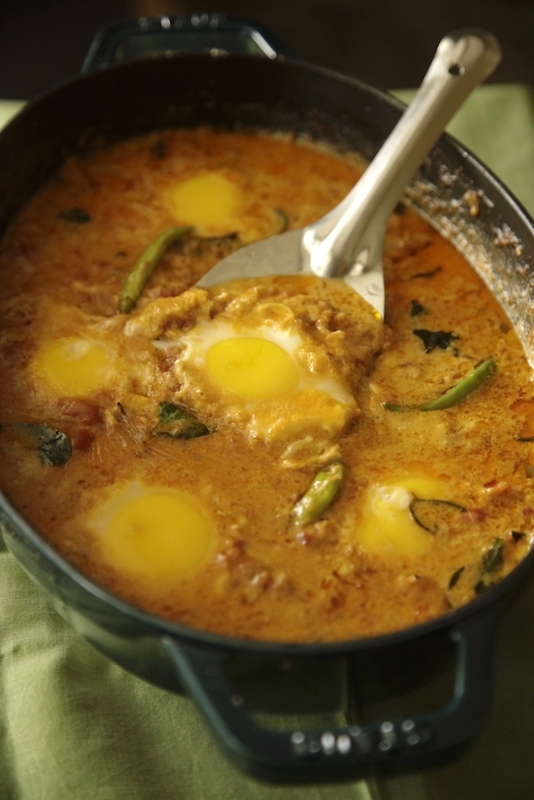 This egg curry saves you the time and effort it takes to peel eggs. 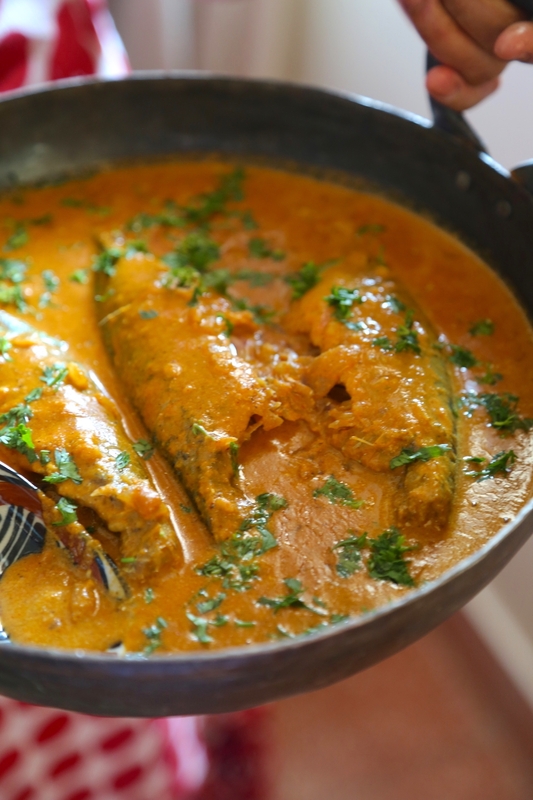 Its a lovely dish to serve to a hungry crowd straight from the cooking pot. Salted or pickled onions make a good condiment for this dish. Heat oil in a large flat skillet, saucepan or casserole no more than 2 inches deep on medium heat. Add bay leaf, cloves and cinnamon stick and saute one minute then add curry leaves and saute 1 minute. Add onions and whole green chillies and saute until soft and fragrant. Add pureed masala paste. Lower flame and cook until reduce to half its volume. Cover skillet and leave a little ajar while this cooks. Stir in coconut milk, 1.25 cups water and potatoes and let simmer 3-4 minutes until volume reduces. Add the eggs only when you are ready to serve the cuury. This gravy can be refrigerated and reheated later. Crack an egg into a small ramekin and slide into the curry one at a time. Allow eggs to cook slowly until whites are set and yolks are soft. Serve in the skillet immediately with bread such as ladi pao, brun pav or a French loaf. I like my red velvet cake to taste like it actually has chocolate in it and I prefer natural coloring where possible. If you don't have beet powder use a food safe red color. The use of beet powder or juice is not new- in World War 2 it was used because it helped keep the cake moist in the absence of butter and eggs. I use butter in my recipe because you get a more moist crumb. I add a little lime zest to my frosting because I feel it really brings the cocoa flavor our in the cupcake. You can omit it if you prefer. While many permutations exist the red color in the cake is integral to this cake being called Red Velvet. A white cake with red frosting is not a red velvet cake and neither is a cake made with beetroot. The red color holds a special place in the south of America where it came to represent the blood of slaves who lost their lives during the civil war. The original frosting for this cake is the Boiled Frosting and not the frothy cream cheese variations you see in bakeries. I have included a recipe for it. I use it when I do a cake but the cream cheese frosting is easier to pipe on small cupcakes. The Red Velvet cake has become so in demand it is now available as cupcakes, cookies, cheesecake and more but it is not a new cake and dates back to the 1800's when cocoa cakes became popular. Velvet cakes had been made since the 1800s. The term red refers to the use of the color red. During the World Wars on account of rationing beetroot was added to to cakes to make them moist in the absence of eggs and butter. 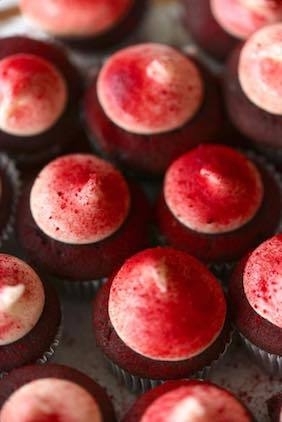 In Red Velvet the cake batter must contain a red colouring agent to qualify as a red velvet cake. One of the most prominent mentions of Red Velvet cake came in 1943 in Irma S. Rombauer’s “The Joy of Cooking”. Looking at the recipe I can tell why Ms. Rombauer did not like Red Velvet cake. There is hardly enough chocolate in it. The Adams Extract company attributes itself to making the “original” Red Velvet cake in the 1920s. Currently you can buy the mix from the company in its vintage packaging. The Waldorf Astoria Hotel in New York City also claims it is the birthplace of the Red Velvet cake, while some say that the Red Velvet cake started in the south. Preheat oven to 350 degrees F and prepare middle rack. Place cupcake cases or liners inside your cupcake pan. Beat in eggs, one at a time. Mix in buttermilk, beet color and vanilla. The batter should be red. If not add more beet color. Spoon batter using an ice cream scoop if you have one, or a large tablespoon into 30 paper-lined muffin cups, filling each cup 2/3 full. Bake 20-25 minutes or until toothpick inserted into cupcake comes out clean. Remove from oven. Place pan on a cool surface and cool cupcakes in their cases completely before you frost them. You can frost them using a teaspoon or a frosting bag of your choice. Beat cream cheese, softened, butter, yogurt or sour cream and lime zest vanilla in large bowl until light and fluffy. Gradually beat in confectioners' sugar until smooth. Cherries are grown in colder climates all over the north and north east of India. In Nagaland they have a unique history. In 1944, the Japanese 15th army occupied Garrison Hill in Kohima, Nagaland. They used a cherry tree near by for sniper practice. What followed was one of the greatest wars ever fought. A small band of British and India troops besieged and outnumbered, halted the Japanese invasion of India. A branch grafted from this cherry tree now lies over the memorial commemorating the sacrifice of 917 brave Indians. Yet many Indians have never heard of ‘The Battle Under The Cherry Tree’. In the USA some cherry varieties hold meaningful stories. Seth Lewelling, a Quaker and Abolitionist introduced the The Black Republican cherry in 1860. He was largely responsible for founding Oregon’s cherry industry. He named this fruit in honor of the Black Republicans, members of the Republican Party who opposed slavery. 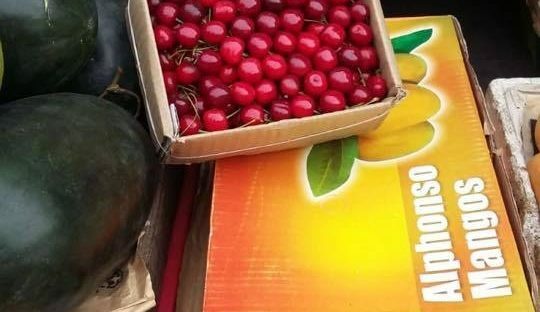 India grows many varieties of cherries but only a few ever get to the markets in the big cities and that too for a very brief period. Cherries are great in salads, make superb jams, can be added to roasted meats and pureed to make gelato and sorbet. 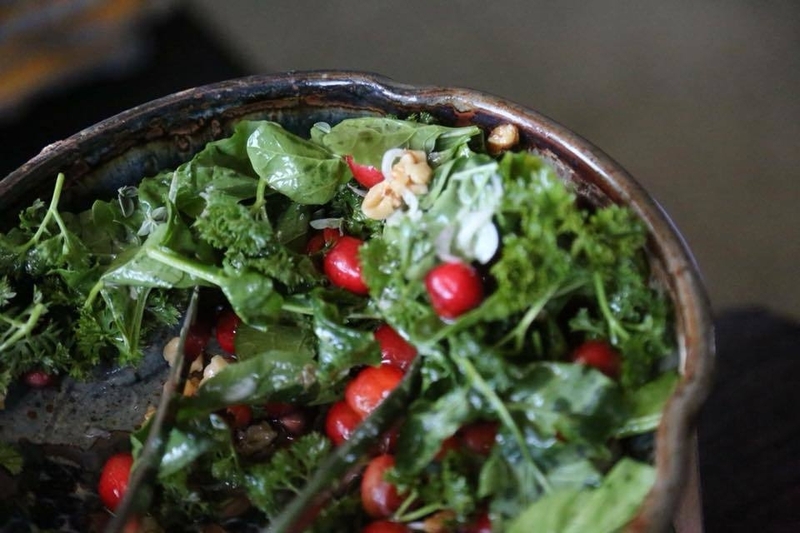 Here is a simple green salad with seasonal cherries that pair wonderfully with toasted walnuts. 1. Whisk together all the ingredients for the dressing and refrigerate for an hour or overnight. 1. Combine all the ingredients for the salad in a large bowl. Pour the dressing over the contents of the bowl. Toss, taste for seasoning and serve immediately. 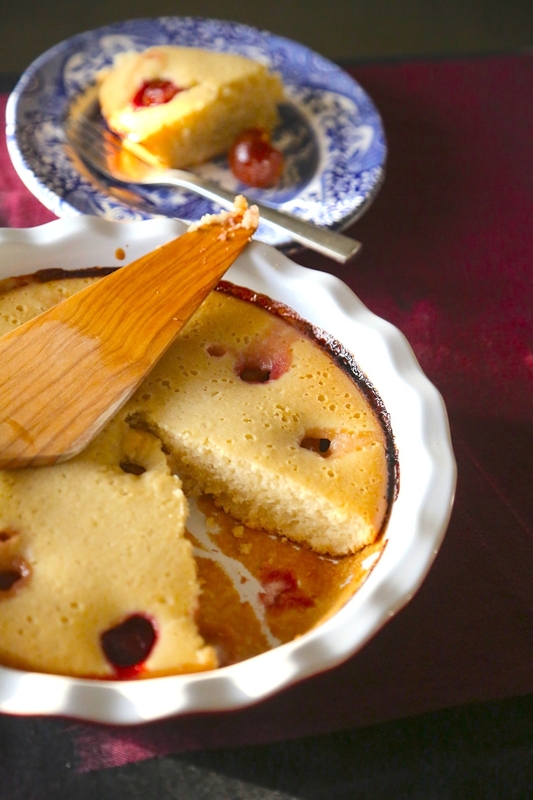 Clafoutis (pronunciation: ​klafuti; is a baked French dessert originating in the Limousin region in south west France, of fruit, traditionally black cherries arranged in a buttered dish immersed in a thick egg and milk batter. The clafoutis is dusted with icing sugar and served lukewarm, sometimes with cream I also like it with creme fraiche. There are several variations using other fruits, including red cherries, plums, apples, pears or blackberries. When other kinds of fruit are used instead of cherries, the dish is called a flaugnarde. In some versions the cherries are not pitted. I like to cook the cherries a bit before I use them which is not traditional but I find cherries do not cook and distribute flavours as fast as pears or blackberries and cooking them adds more jammy flavour to a tart thats otherwise mostly batter. USA and Turkey are major producers of sweet and sour cherries. India’s crop is mostly sweet and comes from Himachal Pradesh and Kashmir (more expensive). The flavours and colour vary dramatically even by the box. White Heart, Black Republican, Early Rivers from Himachal and Black Heart and Early Purple are names that are not familiar to most of us because even though India grows nearly 100 varieties, we almost have never seen more than a couple in Mumbai’s markets. Preheat the oven to 375 degrees F and prepare lower rack. Combine cherries and 1/2 cup sugar in a cooking pot and cook for 10 minutes over medium heat until thick and bubbly but cherries still hold shape. Do not macerate. Stir in the liqueur and let cool completely. Butter a 10 x 3 x 1 1/2-inch round baking dish and sprinkle the bottom and sides with 1 tablespoon of granulated sugar. Beat the eggs and granulated sugar in the bowl of an electric mixer until fluffy, about 3 minutes. Whisk in the flour, cream, vanilla, orange zest, salt, and cherry or orange liquor if you are using it. Spoon cooled cherries and any liquid all over the base of the baking pan. Spread cherries evenly. Spoon the batter over the cherries and bake until the top is golden brown and the custard is soft but set about 30 to 40 minutes. Remove from oven and let cool 35 minutes in the pan. This is a tart that is served in the pan it is baked in. Slice and serve warm or at room temperature, sprinkled with confectioners' sugar, and a side of whipped cream or creme fraiche. A Tres Leches cake also known in Spanish as pastel de tres leches, torta de tres leches or bizcocho de tres leches and pan tres leches ("three milk bread"), is a Mexican specialty. It has 3 components. 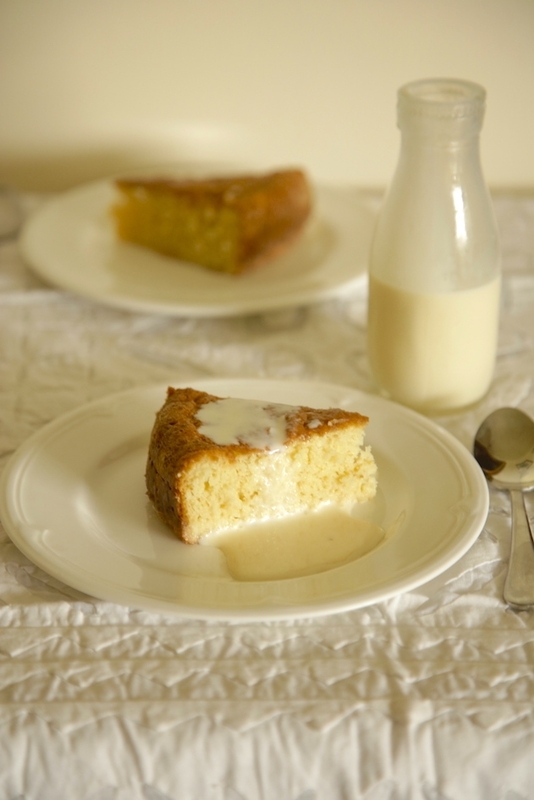 An airy sponge cake with a fluffy topping soaked in 3 types of milk traditionally condensed milk, evaporated milk and cream. Personally I don't like the fluffy buttercream type frosting. This is a rich cake and I think the sponge with the thick milky syrup is ideal. Butter is also used to bake this cake but I prefer the butter free version which gives you a lighter sponge that absorbs the cream mixture better. Sometimes liqueur is added to the soaking syrup and powdered cinnamon is sprinkled over the top. Whisk egg yolks and 3/4 cup of the sugar in mixing bowl until golden and thick- 3-4 minutes. You can do this manually or with an electric whisk. A line should form at the back of a spoon when you run your finger through the batter. Fold the flour and beat until well incorporated. Do not over beat. Whip egg whites, cream of tartar until soft peaks form. Add 1/4 cup fine granulated sugar and beat until stiff peaks form. Fold in whipped egg whites into flour mixture manually. Do not over beat as the egg whites will lose their airiness. Pour into greased pan. Bake for 20-30 minutes or just until golden and wooden pick inserted in centre comes out clean. Remove from oven to wire rack and let rest in the pan until completely cool. Mix sweetened condensed milk, cream, evaporated milk or whole milk, liqueur and vanilla extract and stir well. Remove the cake and place on your serving platter which should have sides to prevent the milk from spilling out. Prick top of cake thoroughly with wooden pick in 8-10 places. Pour 2 cups mixed cream over cake. Spoon excess cream from side of pan over top of cake. Cover and let sit in refrigerator for 40 minutes or until cake absorbs cream. Remove side of pan. The extra soaking liquid can be served on the side. Whip cream, sugar and vanilla extract in small mixer bowl until fluffy peaks form. Spread over the top and sides of cake and sprinkle with cinnamon and dot with tinned cherries if you like. Serve immediately with remaining cream. This recipes call for whole fish but if you are not comfortable with deboning a fish on your plate use thick filets of a meaty fish like halibut or swordfish. Mackerel however, has a unique flavour. Bandga traditionally in Indian cooking is cooked whole except when it is sometimes flaked to make a dish like Kismore. Rub turmeric, red Chili powder, salt and lime juice over the 4 pieces of fish. Cover and refrigerate. Heat 2 tbsp vegetable oil in a pan on medium heat. Add dried red chilies, black gram, cumin, coriander, black peppercorns, rice and fenugreek seeds and toast 3-4 minutes until fragrant. Remove from the pan and reserve. In the same skillet add 1 tbsp oil and toast the coconut and onions 4-5 minutes, stirring constantly to prevent burning. Cook until the coconut begins to dry and turn a light golden brown. Cool all the roasted ingredients and grind to a smooth paste thats free of any fibre or lumps. Heat 2 tbsp vegetable oil in the skillet. Add remaining Onions and green chilli and saute until just softened. Do not brown. Add the ground paste, turmeric and stir well. Add 2 cups of water and tamarind concentrate and cook for 5 minutes on a slow flame. Add the fish and continue to cook until fish is cooked through. This is a whole fish so it takes longer to cook than filets. If the fish is not immersed in gravy you may have to turn it over to ensure its cooked through. Adjust salt, jaggery, red chilli powder and more tamarind concentrate to suit your taste. 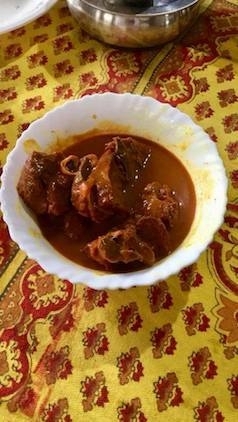 This curry is mildly spicy, sour and bitter with a hint of sweetness that should come from the coconut but if it isnt enough add a little jaggery. Serve hot with boiled white rice and wedges of lime. Garnish with fresh coriander. The vegan version with sour mango is not garnished with coriander leaves and is always served with Basmati you can use any medium grain white rice for the seafood version. This is a quick fix adaptation of a vindaloo for a meal on the run. Vindaloo masalas can vary in spice levels. If the masala is very spicy, use less or add more coconut milk. You can also serve with with boiled, white rice. The pickled onions will keep refrigerated for weeks and you can use them as a condiment with all kinds of dishes. Combine the onions and vinegar in a glass jar. Shake well and refrigerate 3-4 hours or overnight. Heat oil in a small dutch oven or large skillet on medium heat and sauce onions till soft. Add potatoes and toss well. Add tomato puree and vindaloo masala and stir well. Add 2 cups of water, stir well and cook 8 minutes, stirring from time to time. 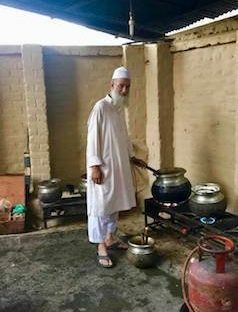 When potatoes are soft but not fully cooked stir in coconut milk and simmer for 10 minutes until the curry bubbles and potatoes are ready to eat. Switch off flame and taste for sweet, spicy and salt. Adjust. Garnish curry with the halved eggs. Garnish the picked onions with chopped coriander if you wish. Serve hot with pao and pickled onions on the side.